Your dentures are an investment and require care and attention to maintain their optimum performance. The fit of your dentures will have a profound affect on your oral tissues and health. An annual examination by DDS Dentures + Implant Solutions will help ensure your denture is functioning properly. Caring for your dentures is vital to your oral health – and can save you money. Ill-fitting or broken dentures not only make it hard to speak and eat, they also harbor bacteria compromising the health of remaining teeth, gums and your overall health. Moreover, dentures are an investment. With the proper care they can last you for years. But if you neglect them, you may find yourself paying for replacement dentures sooner than expected. DDS Dentures + Implant Solutions will help ensure your denture is functioning properly. To keep your dentures functioning properly, good denture care is important. Dentures require proper care to keep them clean, free from stains and looking their best. Make it a point to remove and rinse dentures after eating, and clean your mouth after removing your dentures. Brush your dentures at least once a day with a soft-bristled brush, and always handle them carefully. Don’t bend them when cleaning, and don’t use any tools other than your brush. You also need to keep them moist. When not in your mouth, soak yours as directed by your dentist. Dentures may deform if they are kept in dry conditions. Always, rinse dentures before putting them back into your mouth, especially if you used denture solutions. These simple steps go a long way in keeping your dentures clean and functioning. A regular exam can help identify potential issues before they become problems. A variety of medical and dental conditions can alter denture fit. Ill-fitting dentures may cause bone and tissue changes and need to be corrected for your oral health. Annual exams can also help detect oral abnormalities including cancerous and pre-cancerous lesions. Updating your medical and dental history with any significant changes is critical to maintaining your oral health and well-being. Our practice can assess and recommend solutions to suit your personal needs. schedule an examination today: (844) 557-0643. Bite problems, speech impediments and tissue irritations can be caused by an ill-fitting denture and should be remedied. Leaving this condition unchecked can lead to complicated situations in the future. DDS Dentures + Implant Solutions can assess your dentures for cracks, chips, and broken or loose teeth and suggest solutions. 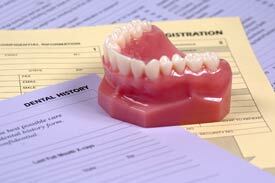 A denture check-up is not much different from your regular dentist visit. Our team will update your medical and dental history chart. Your dentist will examine your oral cavity, assess tissue and bones, check denture stability and examine your bite. We will also clean your dentures and discuss oral hygiene. It’s a non-invasive, quick visit that is very important to your oral health. As always, the professionals at DDS Dentures + Implant Solutions will advise you of any needed procedures or make recommendation to best suit your needs. Consult our practice with questions about your denture care and maintenance, or call today to schedule a consultation: (844) 557-0643.